Petroglyph Card with Castaway Stamp Ink Share Your Work! 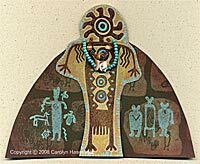 Here is a standup petroglyph card I made with Castaway stamp ink. Beautiful! and thanks for sharing your tutorial!